We know instinctively and from innumerable studies (including i4cp research) that getting onboarding right is crucial for both employers and new hires. But most organizations are terrible at it. Consider the survey i4cp conducted earlier this year— our research clearly shows the correlation between effective onboarding processes and increased retention, engagement, productivity and much more. And the majority of those polled agreed that employee onboarding (done well) should positively influence and reinforce employment decisions, establish a sense of connectedness with the organization, and help new hires become productive as quickly as possible. 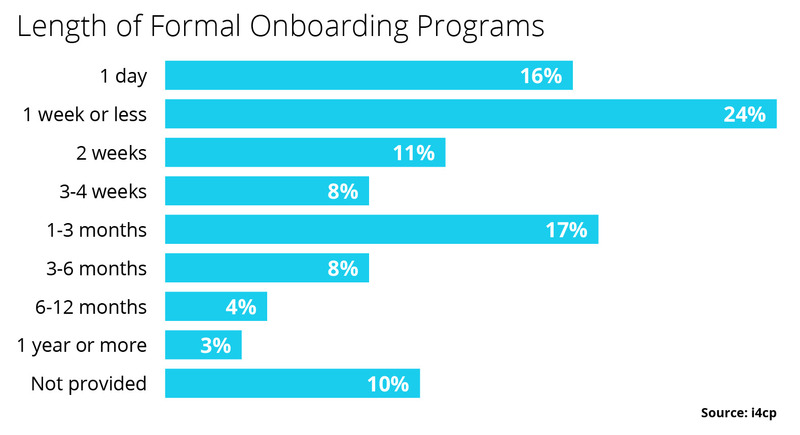 Yet, while 90% of respondents said their organizations have an onboarding process/program, only 44% indicated that their onboarding process/programs achieve desired outcomes. Nearly half (48%) said their organizations get the onboarding ball rolling on or after the new hire’s start date. That’s not soon enough. Leaving a gap between offer acceptance and day one can promote second-guessing on the part of the new hire. Have you ever made a significant purchase but questioned the wisdom of that purchase shortly thereafter? This is an example of cognitive dissonance which, in the field of psychology, is the mental stress experienced by a person who simultaneously holds two or more contradictory values, beliefs or ideas. If consumers experience cognitive dissonance, it also follows that new hires ( consumers of work as per my colleague Jay Jamrog), having just made a major life decision, also experience the same. An onboarding process that starts in the pre-hire phase can help quell uncertainty or doubt that may surface and grow prior to day one of employment. It also enables new hires to contribute more quickly when they start their jobs, instead of being bogged down for their first few days filling out benefits forms or waiting for access to systems and/or direction from their supervisor on what they are supposed to do next. Length of the employee onboarding phase is a consideration too—six in 10 organizations indicate the duration of their onboarding process is less than one month. This is too short. Onboarding should be an ongoing process with multiple components that are aligned with common objectives, rather than a one-time event. Our research found nine in 10 organizations indicated their employee onboarding efforts focus solely on new hires. This is a mistake. Previous i4cp research, Talent Mobility Matters , revealed that onboarding and reboarding of employees who move into new assignments, return to a role after a stretch assignment, or rejoin the organization after spending time with another firm, is a next practice among high-performance companies. That same research found that repatriation of employees returning from expat assignments is also highly correlated with market performance. It’s important to consider how an organization’s culture, market position, and any other number of factors (such as composition of people in key role) have likely changed in some way since these workers left, and they must be reacclimated. The same is true of existing employees transferring to a new geography, function, team, or role. In addition, special circumstances might warrant special onboarding programs—mergers and acquisitions, C-level hires, for instance—and onboarding programs should be considered for new outside directors as well. A comprehensive onboarding process will also help organizations address significant indicators of new hire retention and engagement which are mostly overlooked. For instance, only 20% of survey respondents indicated an objective of their onboarding process is to help new hires establish critical organizational networks. And only 15% said the purpose of onboarding was to ensure consistency between what attracted the candidate to the company and their actual experience as a new employee. Considering the importance so many organizations place on their employee value proposition, employer brand, and employee experience, this presents a major disconnect that organizations must address. Our data suggests that most organizations do not take a holistic and integrated approach to onboarding. That’s the wrong mindset and approach. HR and the talent functions have multiple inputs into the onboarding process and are best positioned to provide the processes and tools to make onboarding successful, ensure all stakeholders are coordinated, and provides on-going guidance to marketing and hiring managers to optimize the new hire experience. The hiring manager must take ownership of new-hire engagement, which includes alignment around roles/responsibilities, delivery of quality, frequent feedback to the new hire, as well as cultural assimilation and network creation. An integrated onboarding process that starts early, continues throughout the first six to 12 months, addresses tactical and strategic elements, and is applied broadly (to include new hires, ex-pats, internal transfers, and re-hires) is a very powerful tool that delivers strong, positive and lasting business impact.